Shimmertastic colors, I immediately said yes. Color me intrigued, fascinated, amused,... Even though I don't know what to do with them in the long run, there's no denying that they are a lot of fun to mess around with! But still, my biggest gripe with these 'shimmery' inks is my inability to come up with a good use for them. To make things worse, I've also restricted myself to only using them in cheap, stub-nibbed pens (Because stub nibs get the most out of them, and because I'm still a bit suspicious about their effect on the pens' internals in the long run). Safe to say it'll take me quite a while to empty one of these bottles - if ever. So far for my rant about them, now let's get on to the things I actually like about the Shimmertastic inks. Because believe it or not, there's quite a few reasons to like them! Diamine came up with ten different colors, each infused with respectively gold or silver micro-particles, depending on the actual ink color. 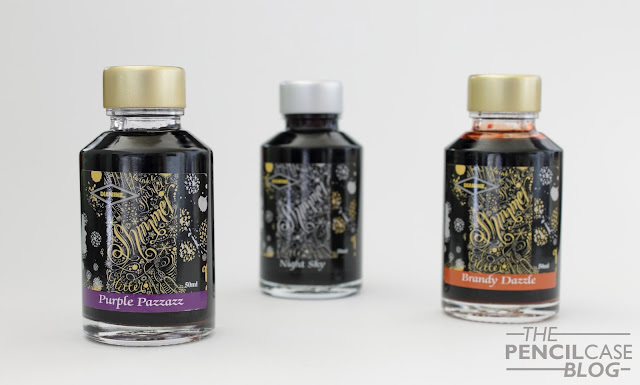 The range of inks is pretty diverse, with a few bright, vivid colors, as well as some more subdued inks like blue-black, grey and black. The darker inks are not all that bad for everyday use, as they aren't too in-your-face. I received three colors: Night Sky (black), Purple Pazzazz (purple), and Brandy Dazzle (brown-ish). Performance has been quite good, considering the fact that some stubs are often finnicky and hard to drive, even with normal inks. In general, the Shimmertastic inks are on the wet side, but not overly so. Flow is good, in some cases great even. And they tend to behave rather good, although that does depend on the pen and nib used of course. Occasionally, I did run into some issues during longer writing sessions, where flow would just stop all of a sudden. Also, it does have some hard-starting issues when your pen hasn't been used for a day or so. I think this behaviour might be due to the particles that seem to settle rather fast (faster than in J.Herbins' 1670 inks), and thus they might block the feed. In both cases, the issue didn't persist, and a quick shake usually solves the issue just fine. If I could give one piece of advice, I'd store my pens nib-up, just in case, so the particles don't settle inside the feed. Overall, I'm still quite impressed with the performance, even with the hard starts. I've had three pens inked up with the three colors I have, and they haven't been cleaned for about two months or so. So far, I haven't had any major issues apart from what I described above, or at least nothing noticeable. Of all three, Brandy Dazzle is definitely my favourite color, mainly because of the nice shading. It's just a very nice, and unique color as well. Brandy-brown-orange is a fairly accurate way to descrive what it looks like, I think. It's a warm color, which is accentuated by the gold flecks. 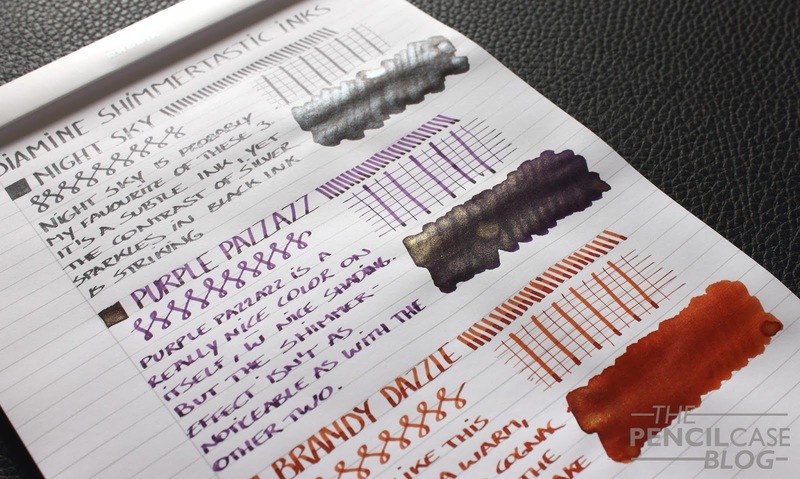 What I found is that both Purple Pazzazz and Night Sky have relatively little shading compared to Brandy Dazzle, which is perhaps a bit to be expected. Black inks never really have very pronounced shading, so I wasn't too surprised to see the results there. Purple Pazzazz seems to have an already fairly dark base color, so it's to be expected that color differences where the ink pools aren't all that noticeable. Colorwise, what I also noticed, is that Night Sky is actually close to a dark grey, instead of a true black. Either way, it does pair up nicely with the silver particles, it definitely looks classy and subdued compared to the others. Purple Pazzazz seems to have slightly less noticeable particles, however I'm pretty sure that might be because of what pen it is in (Lamy Safari 1.5mm nib, slightly dry nib in my experience). There's no waterproofness (surprise surprise!) 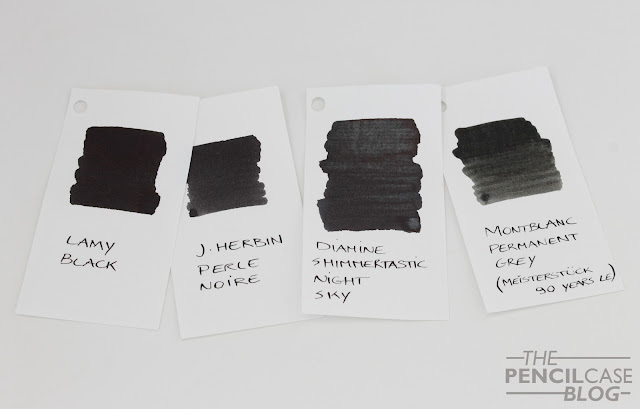 But then again, nearly every non-waterproof ink is, well... not waterproof! Just don't go dancing around in the rain, and you'll be fine. 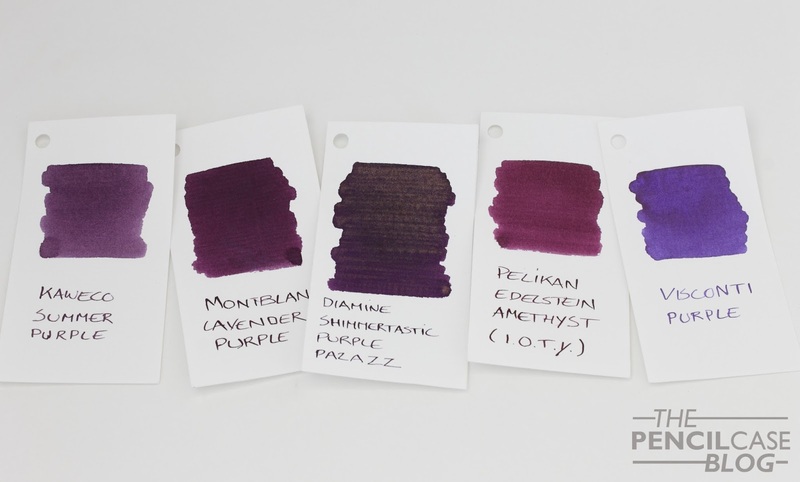 Of course the selling point of these inks are the particles, or at least it should be... 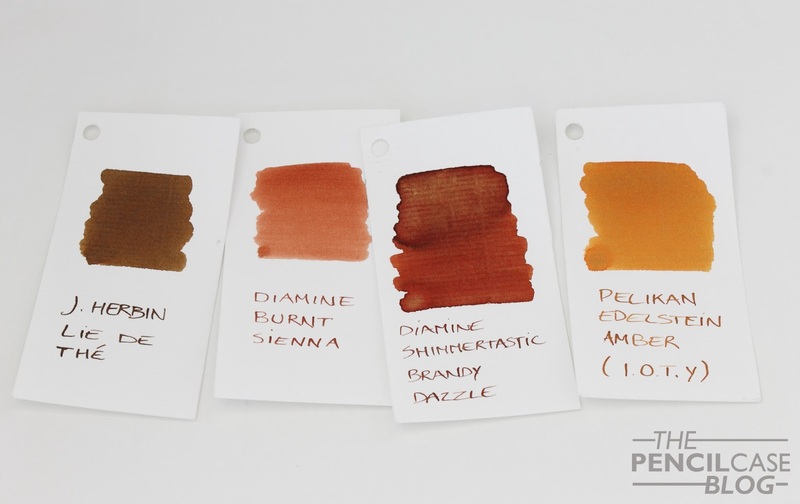 I still don't care too much about it, and my opinion still hasn't changed: You should buy these inks first and foremost for the ink, and take the shimmer as a nice extra! I still find it to be more of a gimmick. Perhaps it's nice for decorating cards or letters, or for other artsy stuff, but for everyday use it doesn't add any value. Decide for yourself if you think these inks are worth it, and if the particles add value to what you'll be using them for. The inks themselves are nice enough, so so you might as well buy them just for the color. 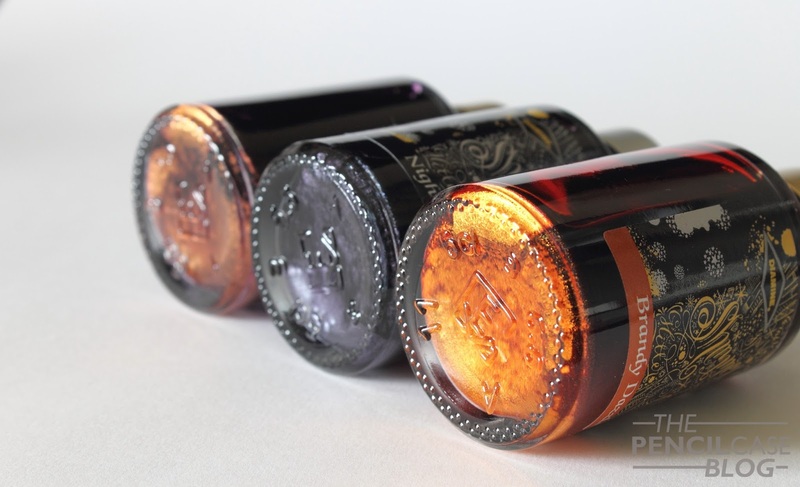 The ink comes in bottles of 50ml, unlike the standard 80ml bottles Diamine uses for their regular inks. In the US, these inks retail for around 20 USD, whereas here in the EU, they are only about half of that, at around 12.5 EUR. So if you're buying more than one bottle, it might be interesting to check out a European retailer like Fontoplumo to order from. Note: Fontoplumo Supports this blog. I received these inks free of charge, so I could write this review. I was in no way influenced in the making of this review, the opinions shared here are completely my own! This review does not contain any affilate links. These look really cool and unusual. I have a granddaughter who is big into calligraphy and is always doing handmade cards for birthdays/anniversaries and I think these would add to her collection nicely. She loves pen sets and getting ink for presents so I am constantly on the lookout for something that I think she'd like. As a side note, look at that Lamy black!! There are some interesting threads on FPN on the subject of these inks. My own experience is negative, sorry to say which is a pity because I quite like the idea for certain things and children seem to like the glitter. My problems seem to be that the feed soon becomes blocked and I actually dont see that much in the way of a glitter effect. 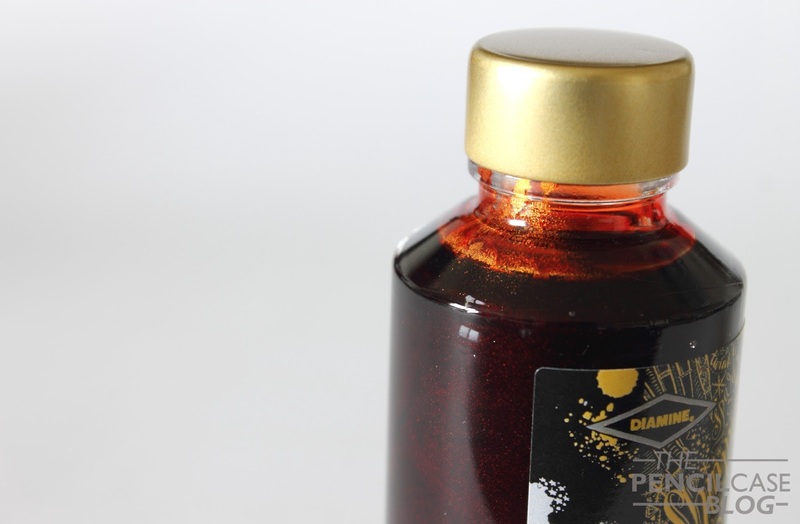 i have shaken the bottle before filling, other people say shake the pen before use, which sounds crazy to me, you cannot shake particles in the ink in the feed! It doesnt help me which I try and encourage other in pen use, they buy some of this ink, blocks their pen and they then say - I remember why I stopped using pens years ago, they get blocked. I get your frustration. I've personally never had clogging issues with these, but then again I don't use them much. 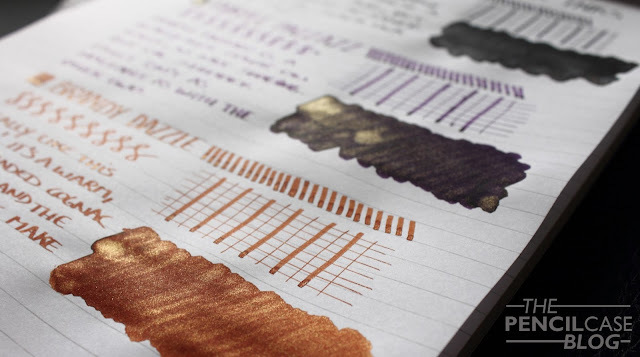 It's really more of a use-and-clean kind of ink, use them a day, and immediately clean your pen out. But in practice they aren't used like that. Shaking the pen before use will force some ink into the feed, it could be enough to dislodge some particles that got stuck.